You have probably heard about foot binding. 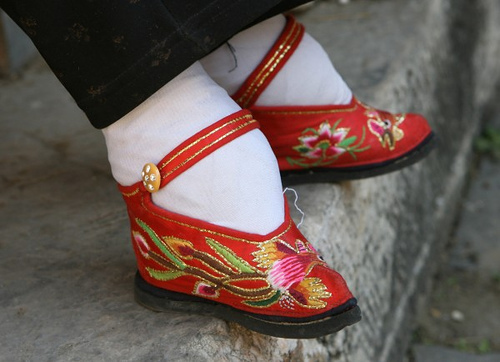 Its an ancient Chinese practice which involved wrapping a young girls feet so tightly that they were prevented from growing. It wasn't uncommon for the bones in the feet to break in the process. Often times severe deformities resulted, infections set in and sometimes girls died in the process. The confines of the shoe and bandages created an handicap that women had to live with for the rest of their lives. So, why am I telling you that your shoes are too small? You are most likely not Chinese & there is a 50/50 chance that you aren't a woman either. But, I bet your shoes are too small too. How do I know? Because we have big shoes to fill. Just like little kids feet, we need room to grow. Or we get distorted and walk with a limp. Why are your shoes too small? Because your dreams are meant to grow bigger. God's calling for your life is meant to increase and the fruit you produce is meant to be abundant. As followers of Jesus, it is our destiny to grow. If we live in the limitations, fears, and comfortable places of a previous stage then we begin to get ingrown. We believe a lie that we don't have anywhere important to go anyway. So, who cares what shoes we wear? Our dreams press against our capacity and we feel inverted and confused. We need new shoes for new seasons. I need to be regularly putting on larger shoes. Making sure that I have room to wiggle my toes and grow into them as God increases in my life. After walking with Him for a while, there won't be room anymore. On with another pair. More room for dreaming & advancing. More capacity to run in roomy shoes. We bind our own feet too often. We are afraid to get bigger. "What if I walk this road alone? I'd rather just wait in this place and grow into these shoes when I get married." "If I walk out, no one will follow me. They won't trust what I bring to the table." "I just got comfortable here. I don't want anything to change." "I'm not gifted. I don't have anything to grow at all. I'm just meant to watch other people do the cool stuff. I observe, others participate." Except a funny thing happens. The tissues and fibers of who we are keep expanding anyway. Even when we try and stay in the same old shoes. It begins to get uncomfortable. Following Jesus is irritating because we get blisters. Eventually we just sit down and stop going anywhere. It hurts too bad. The longer we sit the greater our disfunction grows. And that is where a lot of us are. Sitting on a curb waiting for our feet to stop hurting. Dreams, calling, destiny, capacity...they are all pushing against the boundary begging to be let loose. Risking again on love. Risking again on pain. Risking again to breathe. And then a fabulous thing happens. When we are rubbing our stubby toes wondering what happened to our lives, Jesus comes. Tells us to stop being so scared. Stop being so comfortable. Stop thinking we can't walk any further. He puts these enormous shoes before us. The shoes of Heaven that contain limitless power, hope, and destiny. We are terrified to put them on because we know we can't fill them. Not only that, but our little feet are tiny and tangled. We forget that Jesus is a healer. He touches the deformities and they straighten. The skin and bones go back into place and the painful sores go away. He puts the too-good-to-be-true shoes on. The kind we dreamed of wearing when we were little children. Jesus takes our hand and gently walks with us. Helping us as we go. Little feet tripping along in big shoes. Before we know it, our feet begin to grow again. The shoes aren't so big anymore. Then we begin to run. We remember how fabulous it feels to run. How could we have forgotten the sensation of taking new ground? All of us have new shoes waiting to be worn into fresh ground. Remember, we are meant to be a Church that says " On earth as it is in Heaven!". To do that we need Kingdom shoes. Will you risk putting them on?